Don’t you find this story about Zachaeus to be an odd story? Of course a lot of stories in the Bible are odd when viewed from our 21st century perspective. To understand this story it helps to know a bit about the first century Roman tax collection system. It is not analogous to the IRS. No matter what you think about the IRS, the Roman system was worse. The collection of certain types of taxes was a for profit enterprise. Local people bid for the right to collect tolls and certain taxes. The highest bidder won. They payed Rome in advance and then collected money hoping, well actually planning, that they would turn a profit. “Chief” tax collectors , like Zacchaeus, had employees who collected the money for them. It was a system that invited dishonesty and corruption. In those days, there was no sense that the state, the empire, existed for the benefit of its citizens. It was more a system where the subjects existed for the benefit of the empire and especially the emperor. Israel in Jesus’ time was occupied territory and as you might imagine, Jews didn’t like that. There was a lot of unrest and a lot of violence. Paying taxes to your oppressor was, as you might imagine, not popular. There was no separation of church and state in those days, in fact because of the emperor cult, because the emperor was worshiped, some believed it was not possible to be a faithful Jew and pay taxes to Rome. So the people who collected the taxes were not- to say the least- popular. 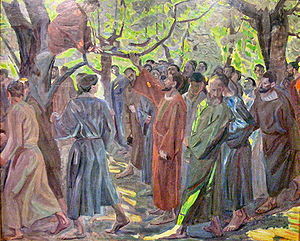 Zacchaeus wasn’t just a bureaucrat, who was following the rules. In the eyes of his neighbors he was collaborating with their oppressors, the enemy, those who oppose the reign of God, and getting rich in the process. Today salvation has come to this house. To our protestant ears that is a very odd thing to say. At first glance it sounds like Zacchaeus earned salvation by his actions. Be generous, earn salvation. But that’s not consistent with what the rest of Scripture teaches. Or maybe Jesus is referring to his own presence, perhaps he means that he, the one who gives salvation, has come to Zacchaeus’ house. And why does he say this house? That sounds like more than just Zacchaeus have been saved. Why doesn’t he say, “Today Zacchaeus you have been saved?” How can a household be saved? This is just an odd story as stories from scripture often are. There are three, at least, interrelated things going on here, I think. First, this passage reminds us that while salvation is personal, it is not only personal. Salvation is about more than what happens to you and I after we die. Salvation is about that, but it is also about more. Romans 8 and Revelation 21, among other texts, tell us that all of creation will be affected by God’s saving actions. All things will be redeemed. There is a communal dimension to salvation. And that is at least, in part, why salvation has come to Zacchaeus’ house. Zacchaeus’ actions don’t occur in a vaccum. The second point is that Zacchaeus’ statement, his giving away his wealth, was the result of salvation not the cause of it. Because Zacchaeus knew Jesus, because Jesus showed up in his house, in his life, Zacchaeus could not remain unchanged. Business as usual was insufficient. He needed to mend the broken relationships he caused in his life and in his community. Zacchaeus knew his actions needed to change, belief alone wasn’t an adequate expression of his salvation. Here’s the third thing, Don’t you think its odd that Jesus doesn’t tell Zacchaeus to get into a new line of work? The rich young man is told to sell everything and follow Jesus. Zacchaeus gives away half and keeps his job? What’s up with that? Why doesn’t Jesus tell him to stop collaborating with the oppressors of Israel; To stop working for the system that opposes the reign of the one true God? To stop working for the people who are going to kill Jesus? Shouldn’t Zacchaeus separate himself from a corrupt and abusive system? Actually the reason, I think, Jesus doesn’t tell Zacchaeus to change jobs has quite a bit to do with the first two points. God’s intention is to redeem the entire world and we have a part in that redemption. And so this story about Zacchaeus can prompt us to think about how the work we do, the things we do, as followers of Jesus, participate in God’s plan. A lot of what I do in campus ministry is help students think about career choices and how their faith shapes their approach to their future jobs. I spend a lot of time thinking and talking about Christian faith and work. This past year I had the opportunity to speak with an MBA class about Christian business ethics. I asked the class to, as a group, make a list of attributes or marks of Christian business practices. As you might imagine they came up with things like honesty, fairness, trustworthiness. They filled most of the chalkboard with ethical business behaviors. Then I asked them what made their list distinctively Christian. Honestly there wasn’t anything on that list, and it was a fairly long list, that a Jew or Muslim or atheist couldn’t affirm. So what does constitute a Christian business ethic? Is there a connection between our Christian faith and our work? My suggestion to them and to you is that as Christians, we need to take Jesus’ statement to love the Lord our God with all our heart, and with all our strength and with all our mind and to love our neighbor seriously. And we need to take seriously the command, and yes it is a command, to love our enemies. How do you do your job loving God? What is work like when you love your neighbor? What is work like when you love your enemy? Can Zacchaeus do his job and follow Jesus? Can you do your job and follow Jesus? During the dot com bust, a client in San Francisco was shutting their doors and taking $220,000 of our dollars with them. Companies here rise and fall but not all have to go into bankruptcy. We held all the cards to throw the company into bankruptcy because we assembled five vendors that had enough debt owed. A bankruptcy for a start-up CEO is a big scar on their record. We asked several Christian business people, and they all basically advised us to “push them into bankruptcy because the CEO isn’t a Christian and scripture only says not to sue a brother and besides…that’s how the game of business is played.”We assembled the other vendors and started calls with a lawyer but it just didn’t feel right. Then, our corporate chaplain called and said: “Haven’t you been freed from hell and death? How can you hold this tiny debt against them after all you’ve been forgiven?” That was all we needed to hear. We made the decision to forgive the debt. We were so happy with this answer and our decision that we walked to the park up the street from our office and danced. Literally, sang and danced. (You’ll note this is a California company, not a West Michigan company) Nancy called the CEO and told him we were dropping the case. He was dumbfounded. Nancy told him “We believe in the teachings of Jesus. We’ve been forgiven of so much and we want to forgive you of this debt. Our only request is that you pay it forward some day.” He started a stunned, muffled reply, “My father-in-law, who is a great venture capitalist in the valley, just led me to the Lord six months ago. I never knew people actually lived this way at work. Thank you, thank you. I will pay it forward.” We exchange emails with him every few years and he tells us each time that this was a defining moment he’ll never forget in his life. I never knew people actually lived this way at work. What does this have to do with Zacchaeus? We don’t know how things turned out for Zacchaeus. It doesn’t appear that he single handedly reformed the Roman tax system. He was a just a small amount of leaven in the Jericho loaf. His small as a mustard seed actions made life easier for families in his town. But as far as we know, Zacchaeus didn’t do what we would consider great things. Honestly, most of us don’t. Because salvation has come to our house, just like Zacchaeus, we live as people who are deeply loved, who are forgiven, accepted and made new in Jesus Christ. And that means we have a calling from God. And oddly enough we all have the same calling. We’re called to love God and to love our neighbor. But each of us does this in different ways. We each have particular gifts and abilities. We each have skills and opportunities. Our call finds it’s expression in our relationships with coworkers, bosses, family and friends. some of us are students. All of us do something and that is where we live out our calling. One of the great insights of the reformers was that all these particular actions, the situations that we find ourselves in, all these varieties of things that we do are the ways God takes care of God’s people. God provides for our needs through the actions of others. God cares for us through our family and neighbors, friends and coworkers. God cares for our family and neighbors, friends and coworkers by using us. All of us matter in this web of caring. Zacchaeus had a difficult calling. It’s not easy to act as a follower of Jesus in a system that rewards greed. Difficult callings aren’t limited to first century Jericho. Many of us find ourselves in similar situations. We find ourselves working in systems that operate by a different set of values. And those values can make loving God and neighbor difficult; and loving our enemies is nearly impossible. But notice, Jesus didn’t ask Zacchaeus to walk away from the real world. Jesus left Zacchaeus deeply part of the Roman world. Jesus, evidently, thought that tax collectors and the Roman tax collection system could be redeemed. And if that is true, is there any job that doesn’t matter? Sometimes we act as if certain jobs were more valuable in God’s sight than others. Missionaries, pastors, teachers, doctors. We tend to somewhat unthinkingly privilege these sorts of jobs and then we give other jobs a bit of a pass. Accounting isn’t really work that furthers the kingdom of God, is it? Real estate? Sales? Roofing? Plumbing? Working at Mc Donalds? Cleaning houses? Part of what the story of Zacchaeus tells us, is that no job lies outside God’s ability to save it, to redeem it. Every job contributes to the kingdom of God because it has the potential to contribute to the care and well being of God’s children. Every job can be done with love for God and neighbor. In every job we have the challenge to love our enemy. The life of Christians is all about small bits of leaven and mustard seeds. Small acts, as Mother Teresa said, done with great kindness. It’s not what we do, its how we do it. How we live our lives, how we do the work, the tasks before us- what ever they are- that’s what matters. We aren’t to withdraw from the world, or to divide it into greater and lesser work. Our task is to engage the world like Zacchaeus and like Jesus, with concern for the people around us. And by our actions, our daily small actions we participate in God’s redemption of all things. Nothing lies beyond the redeeming, saving grace of God. Not even the work of short tax collectors. Thanks be to God. Posted in Bible, Christianity, vocation/work. Tagged Bible, sermon, Zacchaeus. Previous: Previous post: Fun with Physics! Thank you for talking about this. Too many folks leave the Sunday sermon at home, instead of taking it to work where we can really apply biblical principles. The illustration of Zaccheus is perfect. Be honest. Be true. Stay in your job and do it well. Thanks, David for reading and commenting. And thanks for your work at The High Calling. Thanks for drawing attention to these themes and truths, Nancy, and what a powerful example of forgiveness in the business world from the Duartes. Thanks Ben. Yes the Duartes example is powerful. I wonder what the business world would be like if more followed their example?